Chris Heider, the handy dad behind the very popular YouTube video showing how he made a platform bed with storage using IKEA kitchen cabinets is at it again. 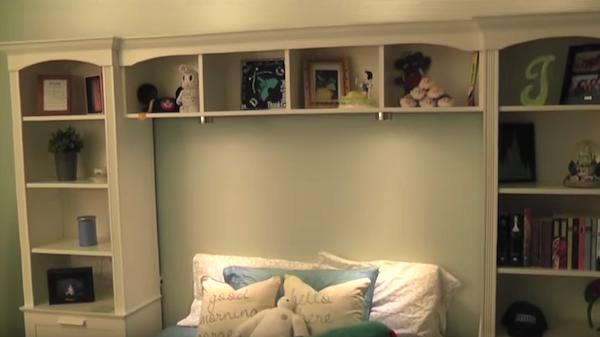 This time he shows us how to use Billy and Brimnes Bookcases, which cost $49.99 and $119.00 respectively, to make a very cool "bed bridge" bookcase. The inspiration was a $1700 ensemble spotted in a catalog. Chris's version clocked in at about $390. The still shots you see here were snagged from his video explaining the process. You can watch that below and read more about the project at Chris's website Handy Dad TV. Totally loved your Ikea bridge book case. I've been looking for something exactly like this! Thanks for the inspiration!